In ACT II, I illustrated how today’s youth are the sacrificial lambs for the ruling elite. Also in this act I introduced the board members and advisors to “We Don’t Have Time.” I explored the leadership in the nascent We Don’t Have Time and the partnerships between the well established corporate environmental entities: Al Gore’s Climate Reality Project, 350.org, Avaaz, Global Utmaning (Global Challenge), the World Bank, and the World Economic Forum (WEF). In ACT III, I deconstructed how Al Gore and the Planet’s most powerful capitalists are behind today’s manufactured youth movements and why. 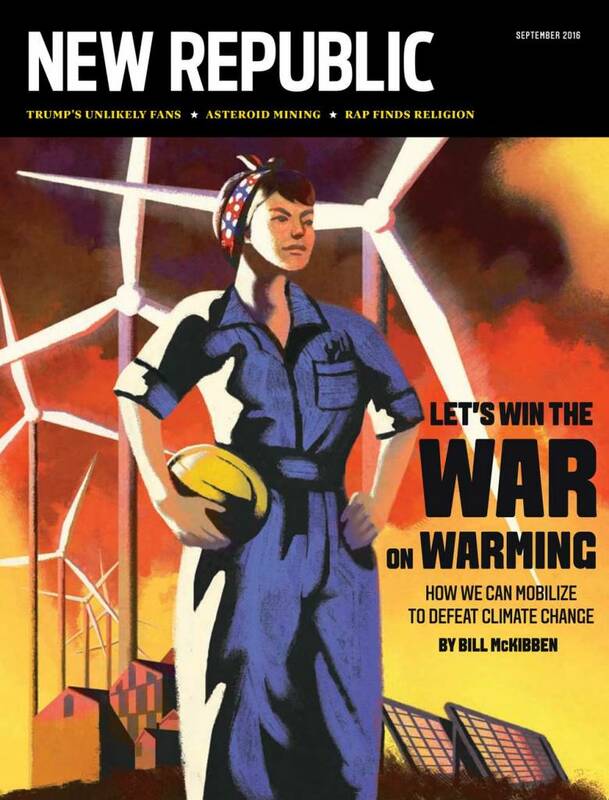 I explored the We Don’t Have Time/Thunberg connections to Our Revolution, the Sanders Institute, This Is Zero Hour, the Sunrise Movement and the Green New Deal. I also touched upon Thunberg’s famous family. In particular, Thunberg’s celebrity mother, Malena Ernman (WWF Environmental Hero of the Year 2017), and her August 2018 book launch. 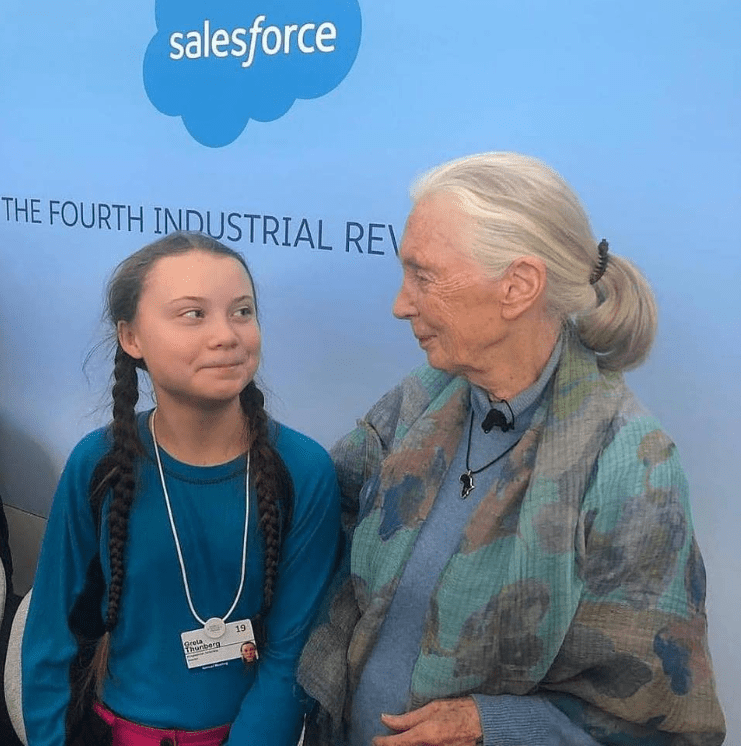 I then explored the generous media attention afforded to Thunberg in both May and April of 2018 by SvD, one of Sweden’s largest newspapers. In the final act, ACT VI [Crescendo], I wrap up the series by divulging that the very foundations which have financed the climate “movement” over the past decade are the same foundations now partnered with the Climate Finance Partnership looking to unlock 100 trillion dollars from pension funds. I reveal the identities of individuals and groups at the helm of this interlocking matrix, controlling both the medium and the message. I take a step back in time to briefly demonstrate the ten years of strategic social engineering that have brought us to this very precipice. I look at the relationship between WWF, Stockholm Institute and World Resources Institute as key instruments in the creation of the financialization of nature. I also take a look at what the first public campaigns for the financialization of nature (“natural capital”) that are slowly being brought into the public realm by WWF. I reflect upon how mainstream NGOs are attempting to safeguard their influence and further manipulate the populace by going underground through Extinction Rebellion groups being organized in the US and across the world. 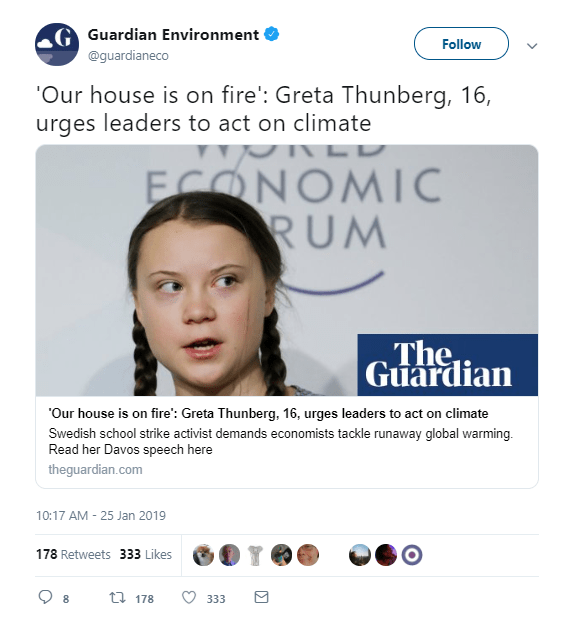 As Greta Thunberg is the founding block of this particular story, revisiting Sweden with the above observation feels like a good place to start part IV of this series where we deconstruct the ongoing marketing campaign with the most recent activity. Thunberg’s words were quickly launched into the international stratosphere of global media outlets and social media. 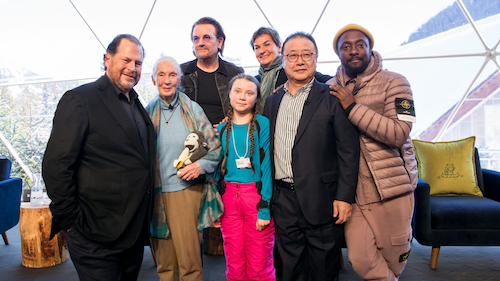 “On Thursday, Thunberg gave an impromptu speech at a lunch with a star-studded guest list that included music stars Bono and Will.i.am, Salesforce CEO Marc Benioff, former Goldman Sachs President Gary Cohn, and an array of bankers and investors. She roasted them. Here it is vital to note the usage of language: impromptu and roasted. 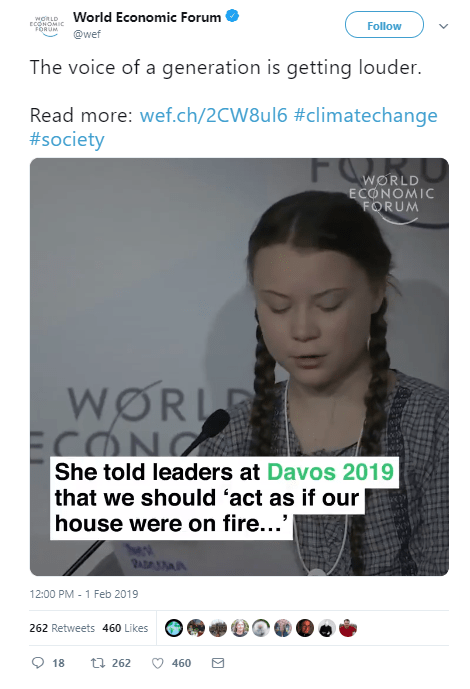 As demonstrated in the above talking points, there is much emphasis from the international media to establish the idea that Thunberg’ speech was spontaneous. As we will illustrate, it was not. 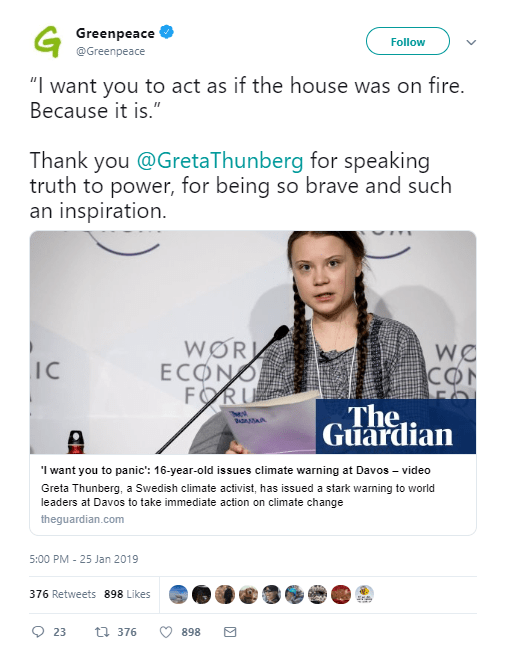 This is merely an example of effective story-telling being put into practise, as orchestrated by the NGOs and corporate alliances that are handling Thunberg. 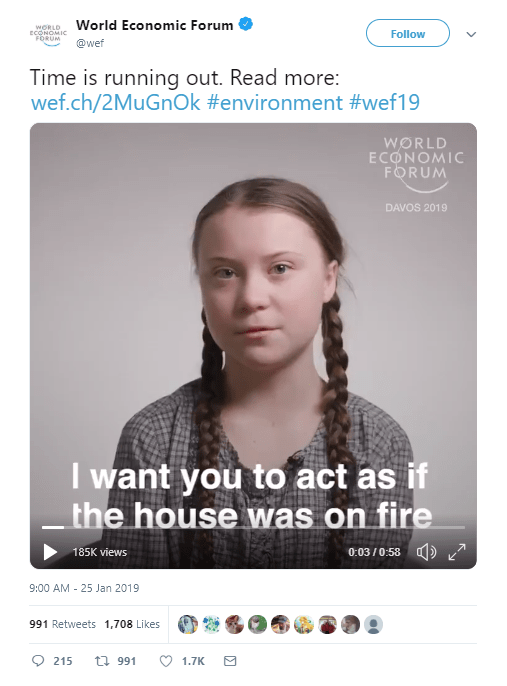 This was not lost on the WEF organizers, whom, in a concerted effort with Greenpeace and Extinction Rebellion, were already sharing the Swedish ecommercial within the WEF event and on social media – prior to the Salesforce lunch panel where Thunberg would cite the passages for media. The attempt by the media, and forces at play, to frame the speech as spontaneous, regardless if it was deliberate or not, evokes a layer of child-like authenticity by the messenger, if not the message itself. In spite of the motive, this is disingenuous to say the least. Our leaders are behaving like children, but thankfully some of our children are stepping up and leading. This compounds with other earmarks of a well-orchestrated media campaign. This bit of social engineering is stunning in it’s blatancy. Like magic, the telling word “salesforce” and the phrase “The Fourth Industrial Revolution”, no longer appear in the image. Such is the primary role of the non-profit industrial complex. Here, we have an NGO that would very much appreciate Thunberg’s sober and “flat” (CNN) delivery style. The Climate Mobilization. Founded in 2014, at the People’s Climate March, the founder and executive director of this US NGO is psychologist Margaret Klein Salamon. The 2014 People’s Climate March was organized by the Global Call for Climate Action (GCCA/TckTckTck), Climate Nexus (“Climate Nexus is dedicated to changing the conversation on climate change”), 350.org, USCAN and Avaaz/Purpose. At the helm of this NGO assemblage was the Rockefeller Brothers Fund working with the V.K. Rasmussen Foundation. Additionally, Climate Nexus is a sponsored project of Rockefeller Philanthropy Advisors, a 501(c)3 organization. The Climate Mobilizations foray into politics began with “Mobilize California” (#Mobilizeca) campaign. Leading the effort with The Climate Mobilization was Naomi Klein and her Leap NGO (Leap L.A. Coalition), as well as a coalition of “like minded organizations”. Here it is critical to note the language: “drawing down the excess carbon in the atmosphere.” Long gone are discussions on reducing or cutting carbon emissions. This is not coincidence. Rather it is again, strategic. Today’s re-designing of our Western subjugation is nothing different than what has been unveiled in the past. Whereas education, health, arts, and all sectors of society were shaped and financed by foundations and their capital largesse, today’s “fourth industrial revolution” remains in the clutches of the ruling elite. This includes the 2014 People’s Climate March – where The Climate Mobilization was born. Extinction Rebellion (to be discussed in part V) has three very broad demands, the primary one being that governments must “enact legally binding policy measures to reduce carbon emissions to net zero by 2025” echoing the talking points brought into the mainstream by the NPIC, the World Bank, et al in 2014. The term “net-zero emissions” does not mean zero emissions. Rather, it is the amount of emissions being put into the atmosphere being equal to the amount being “captured.” Net-zero therefore, the requirement for massive investments into the technologies being developed and rolled out by Bill Gate’s “Mission Innovation“. [For an example of this, one can read the much lauded “Off Fossil Fuels for a Better Future Act” [Section 101–5 “We must significantly increase Federal R&D funding to develop and deploy the technologies needed for deep decarbonization in our economy. This was a proposal announced at the Paris Climate Accord with Bill Gates called Mission Innovation, which committed to double government investment in energy technology.”] Here it is vital to recognize that WEF and Mission Innovation formed a partnership on June 1, 2017. Net-zero is carbon capture storage and a host of other technologies that promise business (and emissions) will continue – as usual. Consider the reality that while we are inundated with anti-pipeline protest coverage, there is zero opposition to the carbon capture projects that are slowly coming online, such as the Alberta Carbon Trunk Line in Canada. Indeed the inconvenient “zero” [emissions] and “near zero” terminology in the 2014 AR5 Synthesis report, was conveniently transformed to the “net zero” term we now see in the public realm, barely missing a beat. 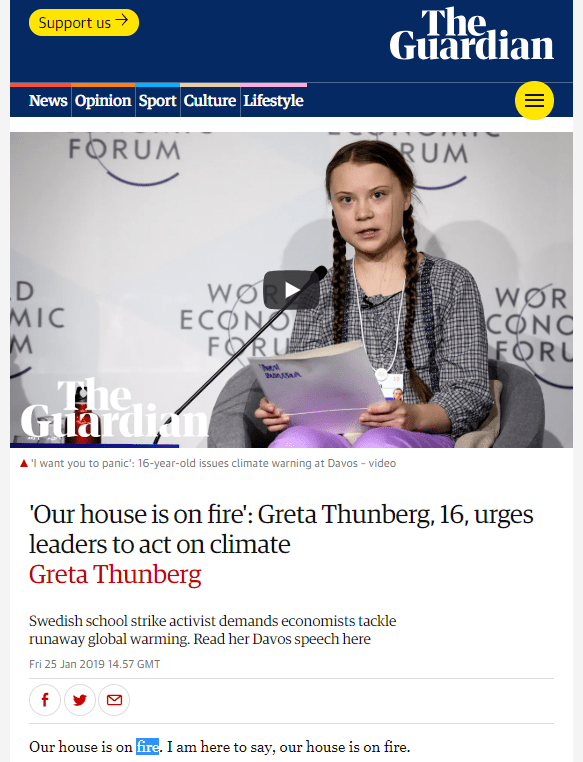 With “capitalism in danger of falling apart” (a rare, cryptically honest quote from Al Gore), and years of stagnant global economic growth now in a free fall, the Greta campaign must be understood for what it is. An elaborate distraction that has nothing to do with protecting the natural world, and everything to do with the manufacturing of consent. The required consent of the citizenry that will unlock the treasuries and public monies under the guise of climate protection. But before we go further into what we can aptly describe as a politically correct – and unprecedented global bailout, we must look at how collective society can be successfully manipulated and manoeuvred, in order to sanction the release of the funds. The very strategy to unlock the public purse – and thus save capitalism itself, is that of a climate emergency. 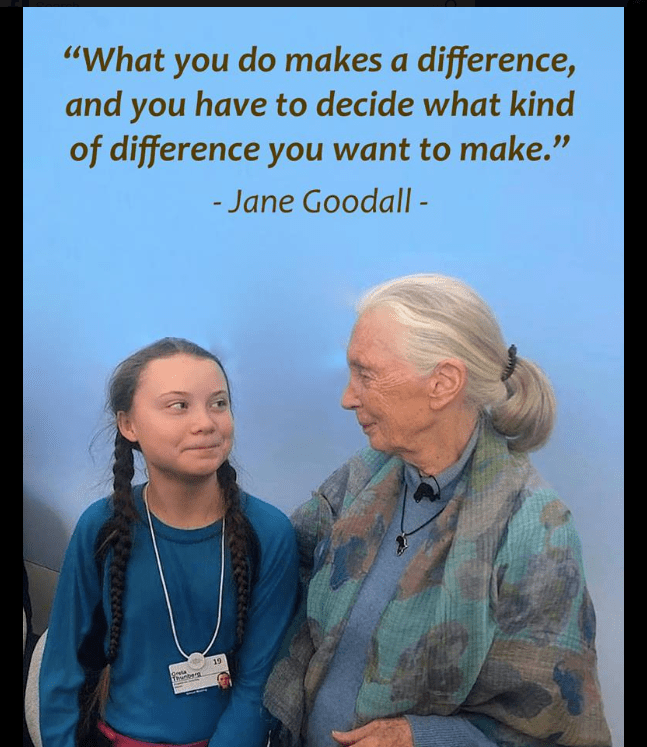 “If you don’t know who Swedish teenager Greta Thunberg is, you can think of her as an international climate-change counterpart to Representative Alexandria Ocasio-Cortez. 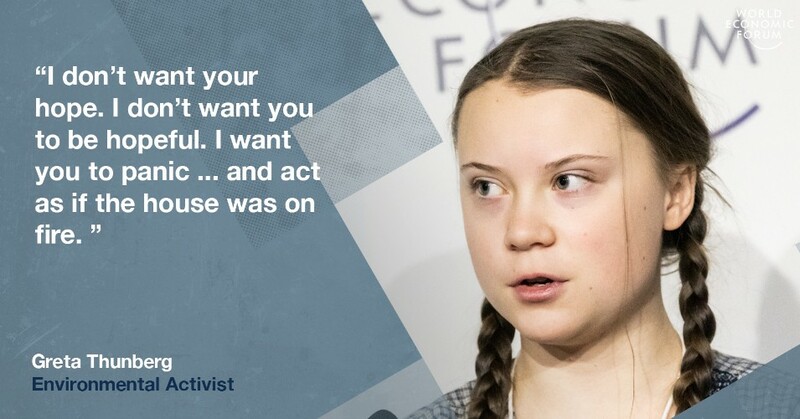 Like the rock-star congresswoman from New York, Thunberg is a charismatic young woman whose social-media savvy, moral clarity, and fearless speaking truth to power have inspired throngs of admirers to take to the streets for a better world and call out the politicians and CEOs who are standing in the way..
“Imagine there is a fire in your house. You do whatever you can to try to put out the fire or exit the house. 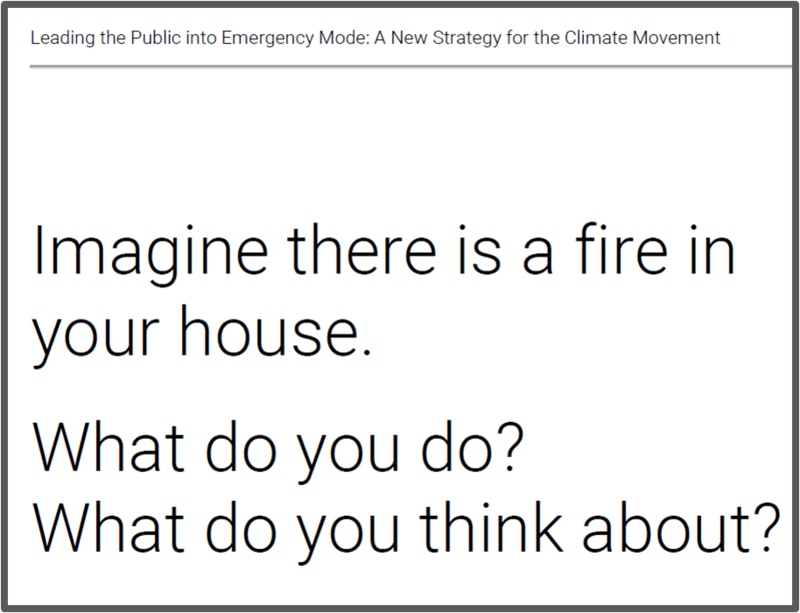 You make a plan about how you can put out the fire, or how you can best exit the house. our senses are heightened, you are focused like a laser, and you put your entire self into your actions. The emergency mode is enacted by the triggering of a switch. And now, in 2019, we see how the strategy as laid out in the paper, has now been deployed in real time, in real life. “‘Feel the fear’ – The spirit of the event was reflected in two attendees with little in common: One is a former vice president of the United States; the other a 16-year-old Swedish schoolgirl. What Al Gore and Greta Thunberg share is anger at corporate executives who aren’t moving quickly enough to address climate change. “I don’t want you to be hopeful, I want you to panic, I want you to feel the fear I feel every day,” Thunberg told attendees. 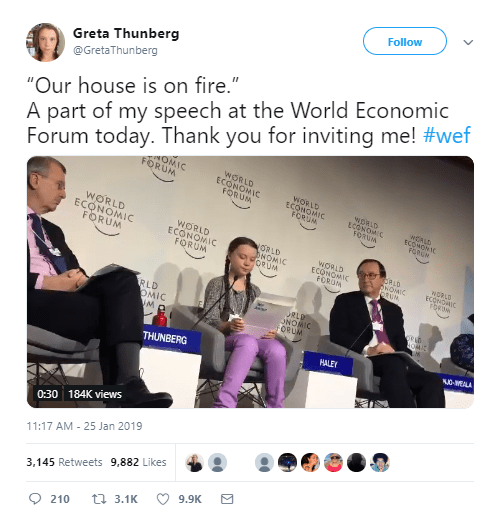 January 25, 2019, WEF, Greta Thunberg, "I Want You to Panic"
Reflecting the aforementioned observations, gone is the language to reduce or stop emissions. Consider the word “stop” does not appear once in the document, while the word “reduce” has one single entry: “If we only reduce the fossil fuel industry’s stranglehold on politicians, the problem will solve itself.” [p. 23] Today’s gently persuasive language, is a mirror image of the language and demands drawn out in the strategy document: “restore a safe and stable climate”, “draw down excess CO2” and “cool the planet”. The document acknowledges that the climate crisis is a “top threat to the global economy“. (highlighted in red font in the original document). [p. 21] What is not stated, yet understood, is the fact that the climate can also be exploited, to salvage the global economy. In essence, to save capitalism. “These pressure campaigns should escalate in degrees of assertiveness, all the way to disruptive protest. However, even in a protest, we must maintain an open, welcoming attitude. Thus, while we will need to be quite confrontational and unwavering, we are not “against” our targets of protest. We gain nothing from demonizing them. We need these leaders to do the right thing. The tone should not be primarily angry, but urgent and insistent. This document is astonishing in many ways. Not once does the author pause to reflect upon what specific societies and nations benefit from industrial civilization on our finite planet – and which ones are sacrificed for the same cause. The said purpose of the strategy, is not the protection of what remains of the natural world, but rather, to “organized civilization” [p. 2] and our “functioning global civilization”. [p. 21] The root word of civilization – is civil. And there is nothing civil about the industrial civilization we have built. The savagery of our global economic system unleashed upon the biosphere, and both sentient and non-white human life, is certainly nothing to boast about – and certainly nothing to protect. It is the global capitalist economic system, that upholds industrial civilization, which must be deconstructed. It is both ironic and telling that even the societies that have benefited the most from industrialization, those in the West (and especially in North America), have never been more miserable. Today we witness an unprecedented crisis of mental illness and depression – with a massive percentage of society now dependent upon anti-depressant pharmaceuticals in order to function in a day-to-day existence. Yet the most egregious aspect of this document, is that despite the references to Pearl Harbour, the atomic bomb and American war efforts of countless stripes, all cited as glowing examples of American ingenuity, NOWHERE is the militarism’s impact on both climate and ecology mentioned. Consider the U.S. Department of Defense is the largest consumer of oil in the U.S. and the largest institutional consumer of oil in the world. With militarism’s phenomenal contribution to global greenhouse gas emissions and environmental degradation – this omission is beyond the pale to say the least. This is the unspoken environmental racism and blatant eco-imperialism that hums beneath the foundational building blocks of the non-profit industrial complex. The power of conformity is a key aspect of social engineering. Its power is tragically often overlooked and grossly underestimated. Of no surprise whatsoever, is the fact, that since Extinction Rebellions meteoric rise to stardom – in perfect symmetry with Thunberg, the group has announced a massive restructuring of the organization. The global expansion is being led by Salamon, [Source] who launched the Extinction Rebellion US twitter account on October 31, 2018 – the same day as the launch of Extinction Rebellion in the UK. The accompanying US website would launch November 3, 2018 and the US Facebook group account would launch on November 4, 2018. 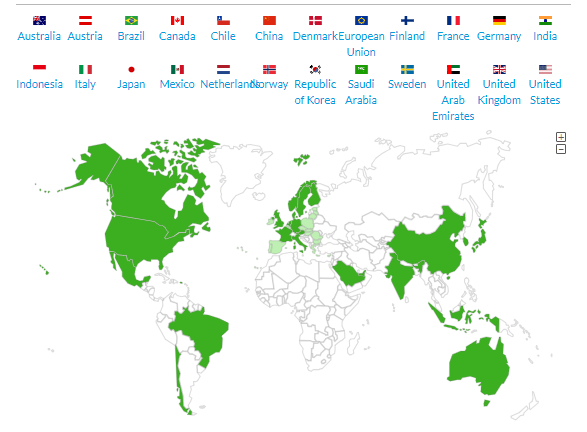 Between the official launch on October 31, 2018, in the UK, to December 6, 2018, it grew to over 130 groups, across 22 countries. By January 29, 2019, the Extinction Rebellion groups spanned across 50 countries. 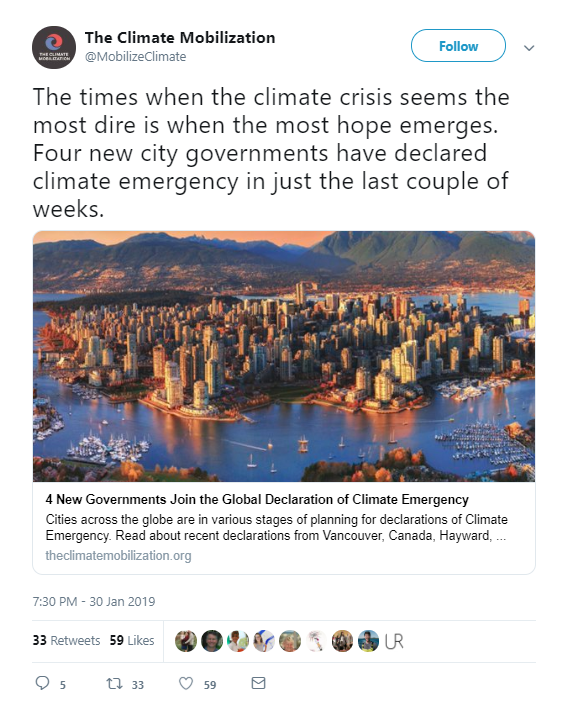 The Extinction Rebellion demands are not only complimentary to The Climate Mobilization’s emergency strategy, they are a mirror image of it with the slogan, “tell the truth”. September 7, 2018, World Resources Institute, The New Climate Economy, "Unlocking Growth"
September 15, 2018, The New Climate Economy, "Unlocking Growth"
January 18, 2019, PFG Equity Partners, Growth via UN "Sustainable Development Goals"
January 31, 2019, The B Team Hammering Home the Message: "Our House Is On Fire"
February 2, 2019, The B Team Hammering Home the Message: "Our House Is On Fire"
The September 20, 2018, Yale Climate Connections article, “Climate Mobilization Plea: Cities Must Declare Emergency” references the “climate emergency language” gaining momentum in perfect stride with a cohesion of intersecting campaigns: the Thunberg campaign, the Extinction Rebellion protests, the Green New Deal, the general climate strikes, and the FridaysForFuture youth climate strikes. “Sanders, an independent who caucuses with the Democrats and ran for the Democratic nomination, isn’t the only politician drawing parallels between climate change and fascist aggression. New York Democrat Alexandria Ocasio-Cortez, who has been hailed as an up-and-coming progressive champion, has spoken about the need for a World War II-style commitment to fighting global warming. The Democratic Party in 2016 included similar language in its official platform. Leading up to the January 2019 Davos gathering, a top Wall Street economist warned investors that they face a tough road ahead with global economic growth ‘now in free fall’. The current headlines read like Orson Welle’s economic version of “War of the Worlds”. 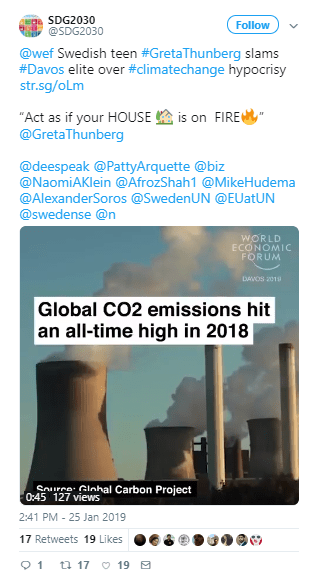 The two institutions identified as the media contacts for the above unprecedented announcement, are the European Climate Foundation and the aforementioned Climate Nexus – lead organizer for the 2014 People’s Climate March. “Nowhere is the investment gap between what is needed and what is currently flowing greater and more urgent, or the opportunities more significant, than in the world’s developing and emerging markets. These economies are generally characterized by growing populations, rapidly increasing energy demand, and extraordinary infrastructure investment needs. But they also tend to have less developed capital markets and higher political and regulatory risk than their developed country counterparts. Institutional investors may therefore be partially forgiven for moving cautiously, even in the face of compelling long-term economic and demographic drivers. A detailed analysis by the World Bank found that while $100 trillion is held by pension funds and other institutional investors, these same investors allocated less than $2 trillion over a 25 year period into infrastructure investment in emerging markets. And the fraction of that investment that could be considered green, clean, or climate-friendly was negligible. It is here that the accelerating “demand” for countries to align with the Paris Agreement becomes clear: “The Paris Agreement requires us to align finance flows in support for a low carbon and climate resilient development.” Note the word “requires”. What was considered non-binding one moment, conveniently becomes binding when it involves opening up the treasuries and pension plans to the our corporate overlords. “The partnership will seek to make investments in a targeted set of sectors including renewable energy, energy efficiency, energy storage, and low-carbon and electrified transportation, across three regions including Latin America, Asia, and Africa. 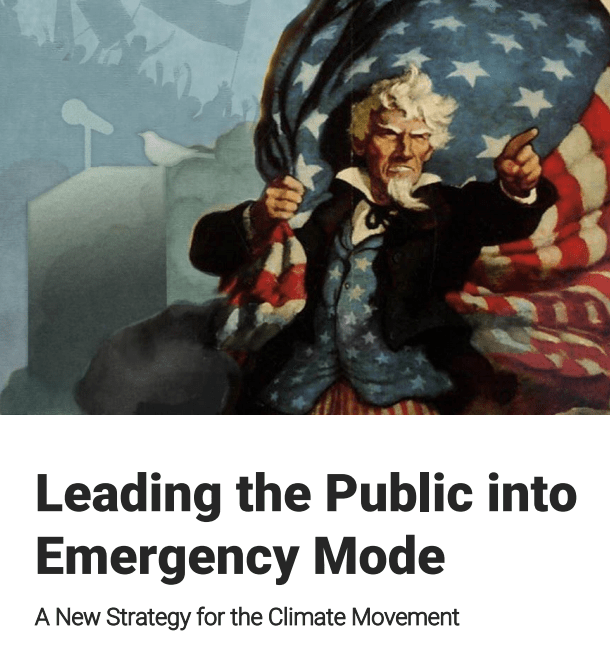 Today’s climate emergency mobilization must be recognized for what it is: a strategically orchestrated campaign financed and managed by the world’s most powerful institutions – for the preservation of capitalism and global economic growth. This is the launch of a new growth industry in the Global South coupled with the creation of new and untapped markets. Leading up to this precipice, The B Team, the Open Society Foundation, Oxfam, and many others that serve as the human face of capitalism, have moved their offices to or set up new divisions in both Africa and Latin America. 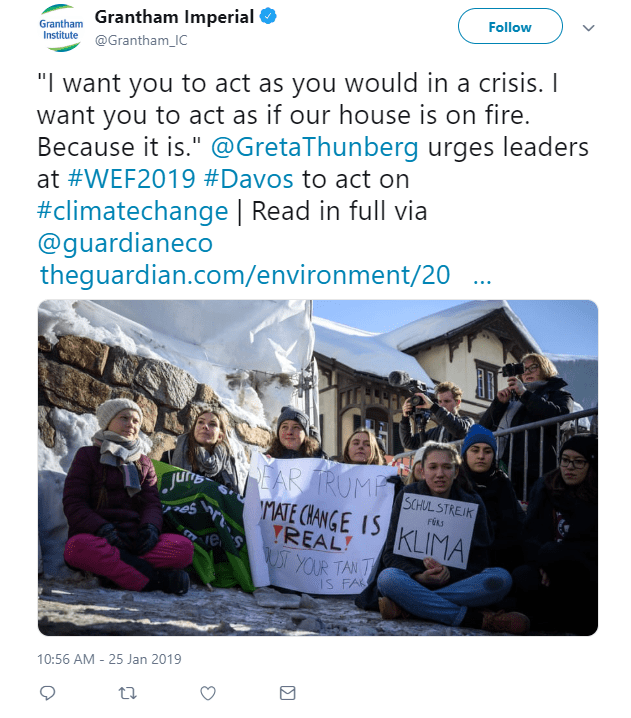 The sycophantic NGOs – in servitude, indeed on the very same team as their corporate benefactors, created a literal, albeit virtual firestorm (encapsulated in the mantra “our house is on fire”) – in order to instigate a “climate revolution”. The collective energy of the West stemming from a growing societal discontent, is being captured and utilized – transcending into a new weapon of choice that will aid the further colonization of the Global South. 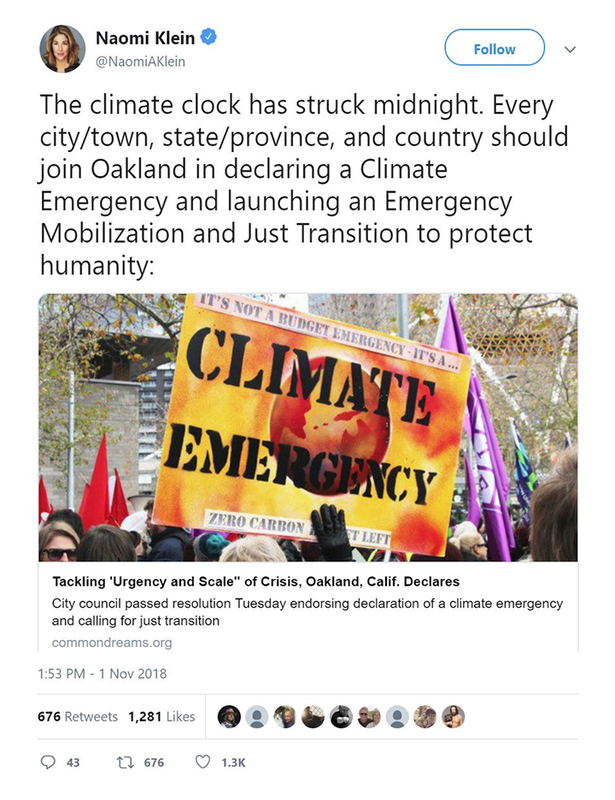 A climate revolution in name only, this said emergency, has nothing to do with the protection of our Earth – or climate – and never will. Rather, it has everything to do with saving, protecting and expanding the capitalist economy – at the expense of our already decimated planet. And nothing more than that. This oncoming new onslaught of environmental devastation and plunder – in the name of climate revolution – will make all of modern man’s historical violence against the nature, up to this point – seem like childish prattle. Yet none of this should come as a surprise. As the oligarchs financed, shaped and largely managed the climate movement – it’s only natural that they alone benefit from it. The power-elites repackaged our oppression as revolution and sold it back to us. By exploiting the innocent youth, which in turn exploited our emotions and fears as a collective populace, we devoured it. And soon, young Greta, and all the youth they have exploited, will be thrown under the bus. It’s all par for the course under capitalism.